Manganese (Mn) deficiencies are common in Virginia soybean and are starting to appear in numerous fields. These deficiencies are not necessarily due to low Mn levels in the soil, but are more likely related to high soil pH levels, as its availability decreases with increasing soil pH. Although soils with a pH of 6.2 or lower can occasional show Mn deficiencies, it is most likely to appear when pH levels reach 6.5 or above. Furthermore, Mn deficiencies are more common on our sandier soils because pH changes more rapidly and these soils typically have a lower concentration of the nutrient. The deficiency will appear as interveinal chlorosis, usually on the younger leaves first since Mn is not a mobile nutrient. This may distinguish Mn deficiency from magnesium (Mg) deficiency. 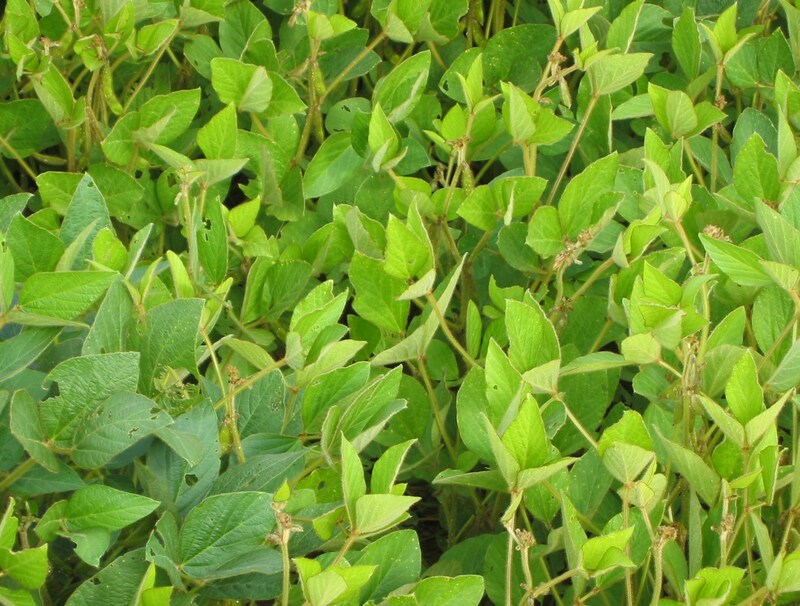 Magnesium deficiency symptoms will usually appear on the lower leaves while the upper leaves remain green. Still, I’ve seen Mn deficiency on the lower to middle leaves. This usually happens when the field has not been checked in a while and the observer missed the symptoms when they were on the younger leaves. Other problems can cause look-alike symptoms similar to Mn deficiencies. In particular, interveinal yellowing is a common symptom of soybean cyst or other nematode damage. Therefore, it may be prudent to further investigate the problem, especially the root system. Scout your fields. Mn deficiencies may or may not materialize. The only sure way to determine a deficiency is to observe the deficiency symptoms through visual observation or tissue tests. The characteristic visual symptom is yellowing between the veins on the new leaves. Mn is an immobile nutrient. Therefore, it will not move out of older leaves to the new leaves. Symptoms will appear when the plant can no longer extract sufficient amounts of the nutrient from the soil. Take a tissue sample. If Mn deficiencies are suspected due to high pH and/or a field history of Mn deficiencies, but no symptoms have yet appeared, you should consider taking a tissue sample. Tissue samples can reveal deficiencies before symptoms appear (hidden hunger). We suggest a tissue test if lime, lime stabilized biosolids, or an ash product was recently applied. Manganese application. To overcome a deficiency, apply ¾ lb. chelated Mn (elemental basis) or 1 lb. inorganic Mn (elemental basis) per acre to foliage upon appearance of symptoms and prior to flowering. 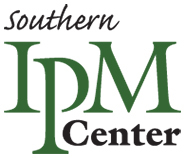 More than one application may be required to correct a severe deficiency. Don’t use low rates to correct a deficiency. Note that many Mn products recommend applying lower rates of Mn. However, the label usually states that these are maintenance rates. Once a deficiency occurs, these lower rates will not correct the deficiency and the rates stated above will be needed. Split Mn application on deficiency-prone soils. 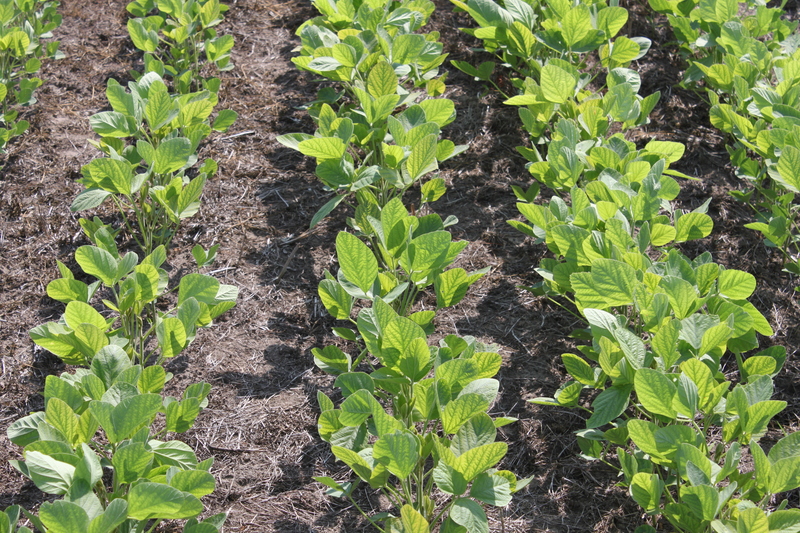 An alternate method of application can be used before a deficiency is evident on soils that commonly show a deficiency, especially on soils that have a high pH (above 6.8 or so). A lower rate (~ ½ of that listed above) can be combined with another scheduled application, such as a postemergence herbicide or insecticide. This may be a sufficient rate to prevent a deficiency from occurring. But, continue to scout the field and take future corrective measures if visual deficiencies appear. If a visual symptom appears, you need to use the full rate. I will remind you that this is a preventative treatment. A deficiency may not occur. Furthermore, these are only maintenance rates and another application will likely be needed if the field is truly deficient. Use EDTA chelated Mn formulations when mixing with glyphosate. Be reminded that some Mn formulations in combination with glyphosate herbicide (Roundup, Touchdown, many generics, etc.) will result in reduced weed control of certain weeds. Other herbicides have not shown to interact. 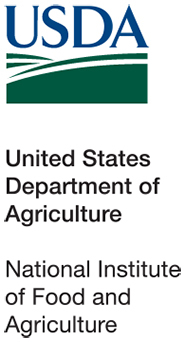 If including Mn with glyphosate, use the EDTA chelated formulation as it has shown not to interact. Should I Apply a Foliar Feed to My Soybeans? The high prices over the last few years have allowed many of us to experiment with certain practices that, at best, might occasionally increase yields. The return of investment usually only required one bushel (or less), depending on the input. But that was when soybeans were $13, $15, and even $17 per bushel. But now, you may be able to sell your crop for $10-11 (if you still have any in storage) and the future prices are reflecting record acreages. So, it seems that I’ve been asked, “Should I apply a foliar feed to my soybeans?” more this year than in the past few years. First, I still stand by what I’ve said in the past and still say today: “Feed the roots and not the foliage.” Soybean will remove 3 to 4 lbs of nitrogen, 0.8 lbs of phosphorus, and 1.4 lbs of potassium per bushel of seed produced. These large amounts will need to come via root uptake; it is not economically possible to apply these amounts through the foliage. But, once the soil needs are met, will additional fertilization help? First, an application of Manganese may be needed if your soil pH inches much above 6.5. I’ve even seen Mn deficiencies when the pH is as low as 6.2 (using fall/winter soil test levels) and the soil is “wet natured” or if lime was recently applied. There are also certain varieties that tend to show Mn deficiency sooner than others. 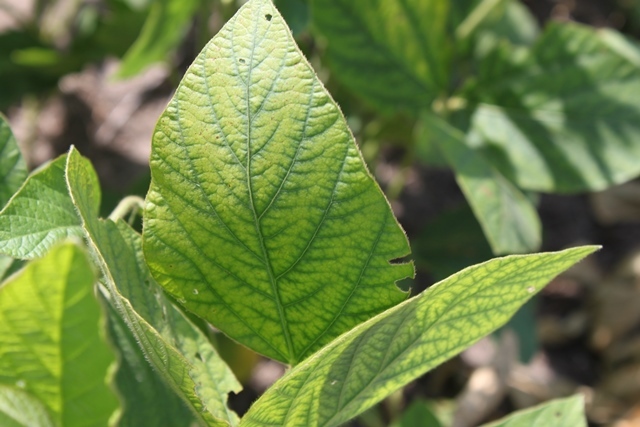 So, if you see the characteristic interveinal chlorosis of Mn deficiency or if soybean are growing in a field that typically exhibits such a deficiency, then spray Mn. Another issue that I’m seeing this year is a general yellowing of plants, usually just in seemingly random spots in the field. Upon closer inspection, these are usually very wet areas (there are plenty of those this year) or sandy knolls. In the saturated soils, the yellowing is likely due to lack of oxygen and/or poor nodule development. The only cure for lack of oxygen is for the soil to dry out. Poor nodulation is indirectly a response to lack of oxygen – the nitrogen-fixing bacteria have temporarily stopped functioning. But they will recover and provide the nitrogen when the plant needs it the most, when the pods are forming and seed are filling. Will a shot of foliar nitrogen help? Yes, it will green up the plant if lack of nitrogen is the problem. Will this shot of nitrogen (assuming that nitrogen is the problem) increase yield? Maybe. Maybe not. If lack of oxygen is the problem, then probably not. Even if lack of nitrogen is the problem, probably not. I want to caution everyone to not make assumptions that lack of nitrogen is the problem. Is this N or S deficiency? The only way to know for sure is to take a tissue sample. A deficiency that closely resembles nitrogen deficiency is sulfur. On those sandy knolls, I’ve seen sulfur deficiencies. Sulfur will leach just like nitrogen. But, soybean will not produce its own sulfur. A shot of nitrogen would do nothing to help in this case. The take home message is to determine the cause, then act on that information. But what about other nutrients? What if there is no visual symptoms of nutrient stress? What if my yield potential is very good? My attitude towards this is that it usually won’t hurt (but be careful mixing with other chemicals), so do what makes you sleep better at night. If you think it is helping your crop, then make the application. It’s your money. You know your fields better than anyone. But, I have rarely seen a response to foliar feeds if you have maintained adequate soil fertility levels and have managed the crop for maximum economic yields. Again, yield response to foliar fertilizers is, at best, inconsistent. Manganese (Mn) deficiencies are starting to appear. 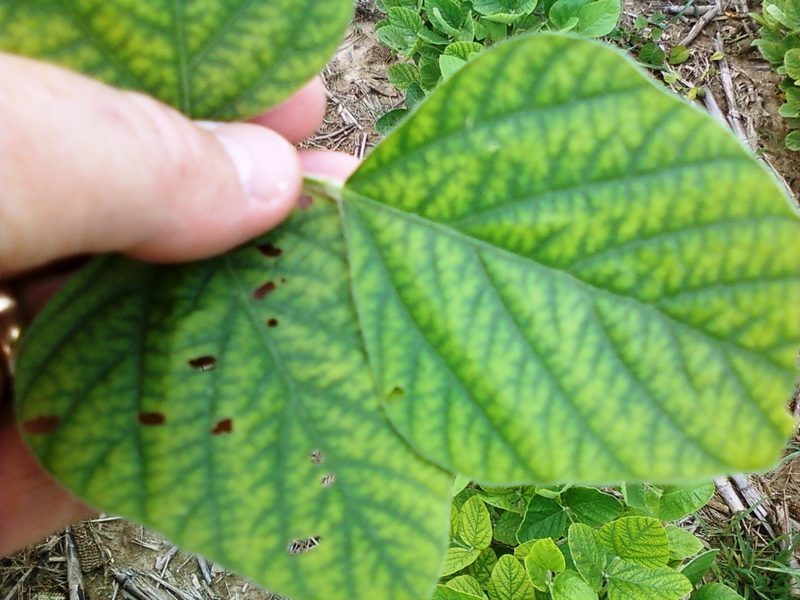 Such a deficiency is common in Virginia soybean, but these deficiencies are not necessarily due to low Mn levels in the soil. 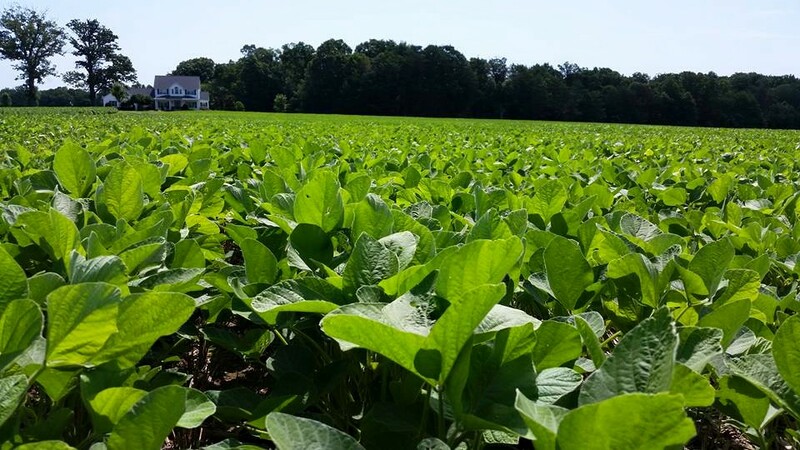 Instead, like many micronutrients (nutrients that are needed by the plant in small amounts), Mn availability to the soybean crop is directly related to soil pH. When pH levels reach 6.5 or above, Mn deficiencies will likely appear, especially on sandy soils. However, some soils with a pH of 6.2 and lower can show deficiencies if soil Mn is low. Generally, Mn deficiencies are more common on our sandier soils as pH changes more rapidly and sandy soils typically have a lower Mn concentration. The deficiency will appear interveinal clorosis, usually on the younger leaves first since Mn is not a mobile nutrient. This may distinguish Mn deficiency from magnesium (Mg) deficiency. Magnesium deficiency symptoms will usually appear on the lower leaves while the upper leaves remain green. Still, I’ve seen Mn deficiency on the lower to middle leaves. This usually happens when the field has not been checked in a while and the observer missed the symptoms when they were on the younger leaves. Other problems can cause look-alike symptoms similar to Mn deficiencies. 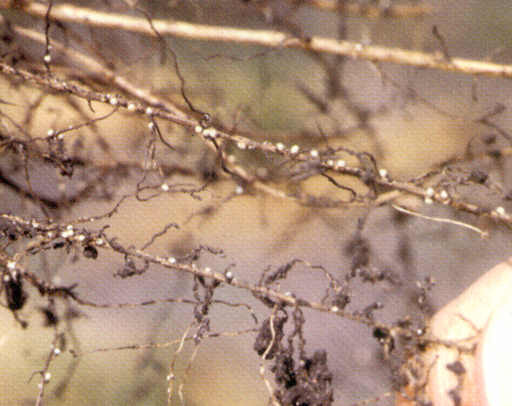 In particular, inter-veinal yellowing is a common symptom of soybean cyst or other nematode damage. Therefore, it may be prudent to further investigate the problem, especially the root system.